Places to see in Dhupjhora: Dhupjhora is located in the South Gorumara Forest Range. The Gorumara Jungle, the adjacent tea gardens, the meandering Murti River, the Tree House and the elephant camp itself are the attractions of Dhupjora. Nearby attractions around Dhupjhora: The entire Dooars range of jungles like Chapramari, Chalsa, Neora Valley, Chukchukia, Jaldapara and others are located nearby. You can also travel upto Bindu, Jhalong, Samsing, Suntaleykhola, Paren and other areas near the Dooars. Things to do in Dhupjhora: This is an Elephant Camp where the Forest Department’s elephants are kept and cared for. These jumbos regularly check out the forest with their mahouts and forest guards for injured animals and miscreants. After completing their job they take the tourists staying at their camp for jungle safari. 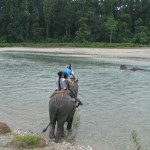 Tourists can enjoy elephant safari everyday either in the evening or morning. 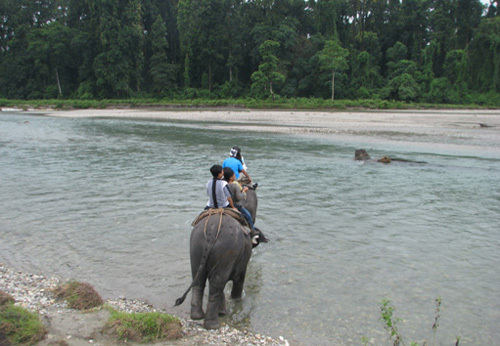 Crossing the Murti River on elephant back and entering the Gorumara Range is a unique experience. How to reach Dhupjhora: Dhupjhora can be reached by hiring cars from NJP (New Jalpaiguri Railway Station) or Siliguri or Bagdogra. First you have to reach Lataguri (75 kms from Siliguri) and then drive straight for 10 mins to reach the Rhino Crossing (Gondar More) where you would find a statue of a Rhino and the Checkpost for Dhupjhora Elephant Camp on the right. You have to verify your permit here and enter the Elephant Camp. The Dhupjhora Elephant Camp is located adjacent to the Gorumara forest with a tea garden as its backdrop. The Murti River is a 10 min walk from the camp skirting a way through the fringes of the forest and crossing a few streams. You can also reach Dhupjhora from New Mall Junction Station. Best time to visit Dhupjhora: October to March is the best time to visit the Dhupjhora Elephant Camp. However, the camp stays open throughout the year and arranges elephant safaris to different parts of the jungle. In the rainy season, most parts of the jungle stays out of reach for the tourists so the safari is held in selected areas of the jungle. Nevertheless, you have very good chance of sighting Rhinos, Bisons, Deers, Monkeys, Peacocks and other animals any time of the year. Lodging and dining facilities in Dhupjhora: The Dhupjhora Elephant Camp is the only option for staying here. The camp has six cottages on stilts and a tree house for the tourists. All meals, cultural programs, elephant safaris are arranged by the camp. You have to book your accommodation beforehand (there is no spot booking facility) from the Office of the Divisional Forest Officer.